Recompute Blog: OpenOffice - Why it matters? OpenOffice - Why it matters? OpenOffice is an open source program that has been continuously developed and improved over a time span of twenty years. With more than 100,000,000 downloads, it is one of the most successful and widely used open source programs on today's market. And it is absolutely FREE. 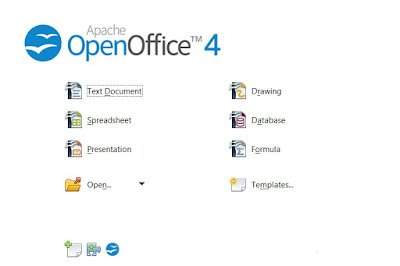 OpenOffice is a multi-platform program, as such it can be installed and used on a variety of operating systems including Microsoft Windows, Linux and Apple Mac OS X. The OpenOffice suite is also compatible with other Office Suites allowing users to view and edit documents created with OpenOffice in other office productivity suites, such as Microsoft Office. Additionally, the fact that OpenOffice allows for anyone to report a problem, suggest any improvements and/or request a new feature highlights the notion that it has been developed in order to maximise usability by meeting its user's requirements. OpenOffice has an aesthetically pleasing and simple interface that mirrors many other Office Suites, therefore allowing both new and experienced users to utilise it without any additional training. Furthermore, it includes a wide variety of office productivity applications. Writer is a word processing application included in the OpenOffice suite. It lets you create a wide range of word documents including simple documents such as letters and résumé's to complex text documents that include bibliographies and indexes. It also envelops features that aid in word processing such as Auto Correct, SpellChecker and a variety of templates to suit different users. Writer also allows user's to import and save documents in .doc and .docx format, so that their documents will be compatible with Microsoft Word. You can also export text documents in .pdf format from Writer. Furthermore writer includes the ability for users to customise the program interface in accordance with their preferences. Clac is a very powerful application which allows users to create, view and edit spreadsheet documents. It provides range of functions to perform complex calculations in order to retrieve meaningful information. It also provides functionalities such as cell formatting, creating graphs, inserting pictures, multiple user support and an array of others. Calc allows users user's to create formulas using words e.g. sales - costs and supports .xls and .xlsx files ensuring compatibility with Microsoft Excel. You can also export documents created in Calc, in .pdf format without any additional plugin. Base is a full featured database application that is extremely similar to Microsoft Access. Base provides industry standard functionalities like creating and changing data in tables, maintaining indexes on tables for quick data access and allowing access to external database applications like MySQL or PostgreSQL. Bases' built-in Report Wizard also ensures users are able to create reports. Impress provides a wide range of tools to create impressive presentations with an array of features including animations, 2D or 3D graphics and additional forms of multimedia. It also supports multiple monitors allowing users to display slides on one monitor and relevant notes on the other. Impress also allows users to import, edit and save presentations in .ppt and .pptx format ensuring it's compatibility. Draw gives users access to a variety of tools to create and manipulate graphics from different formats including GIF, JPG, and PNG. With draw, you can create flowcharts, network diagrams, organizational charts and a wide range of other diagrams. It also allows it's users to customize its' toolbox in order to suit their needs. Math allows users to create, edit and format complex mathematical equations and formulas using numerous built-in operators, mathematical functions and formatting assistants. It is commonly used to add equations into other OpenOffice applications like Calc and Writer. Math also allows users to import, create and add their own mathematical symbols into it's catalogs. © BH Supplies Pty Ltd t/a Recompute ABN 41 095 567 454. Simple theme. Powered by Blogger.